Saturday, Nov. 3 was a busy day at Alliance High School with the Kiwanis Pancake Jamboree taking over the cafeteria and the Band Boosters Craft Show taking over the halls and lobby of AHS. The first Saturday in November is always set aside for pancakes in the Alliance community. 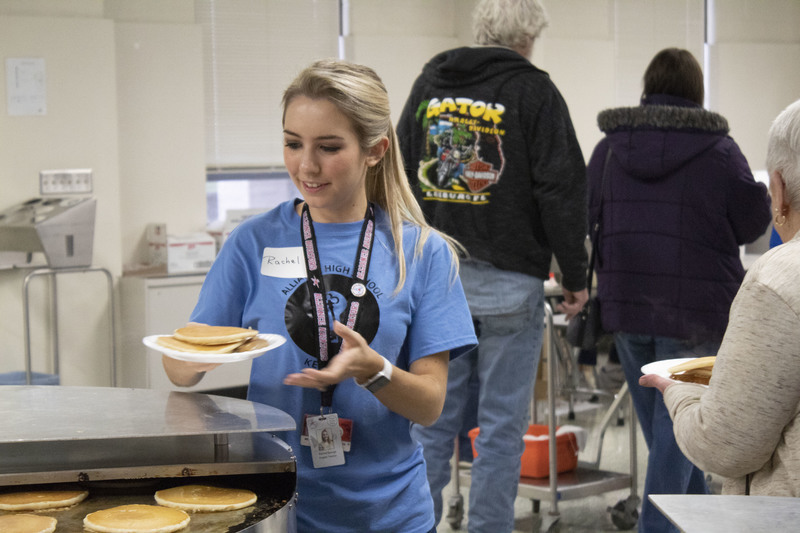 Every year, hundreds of community members fill the high school cafeteria, waiting in long lines for their pancakes and sausage links. Tickets are sold weeks in advance with dozens more sold at the door. But it’s not just the pancakes that bring the community together, it’s what the money goes to- scholarships. Most of the money raised during the yearly event funds a number of scholarships given to Alliance students each year. 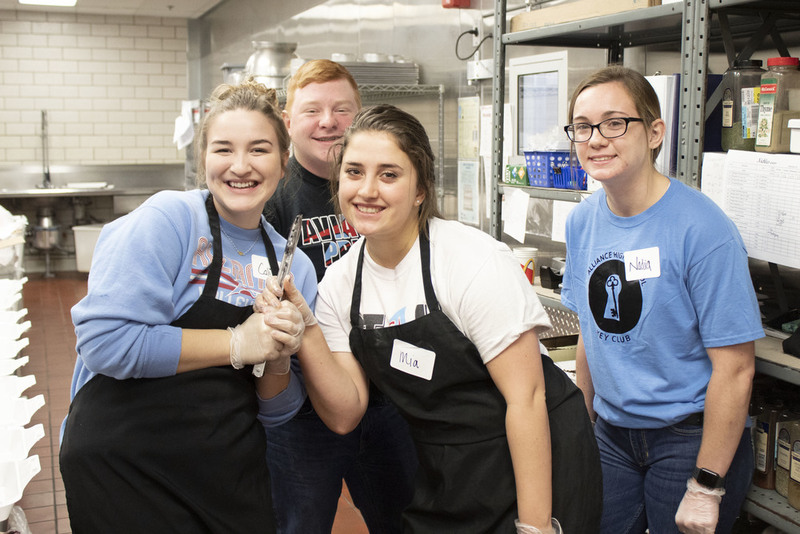 In order for the 6-hour pancake breakfast to run smoothly, volunteers are needed to man the grills, pour the pancake batter, cook and pass out sausage links along with many other jobs. Members of the Kiwanis Club of Alliance assist throughout the day, but they’re not the only ones. Students from AHS volunteer their time each year, many of which are members of the AHS Key Club. “It helps make the jobs easier,” said Julie Lee, current president of Kiwanis. The students worked in shifts throughout the day. They assisted the Kiwanis volunteers however they were needed. Savannah Heller, a junior, and Emma Huff, a freshman, were tasked with opening boxes of pancake mix. After eating at the pancake jamboree, the attendees were encouraged to visit the craft show. “Eat pancakes then walk them off while shopping,” joked Lucinda Kelly, the chairperson of the craft show. The craft show is a fundraiser for the Band Boosters. The money goes towards uniforms, food for the band members, paying off the new band bus, travel for away games and any other expenses that may arise throughout the season and school year. There were various vendors who attended selling everything from toys to homemade crafts to cosmetics. Each vendor was able to set up for the six-hour long craft show a couple of hours in advance to prepare for the arrival of the shoppers. 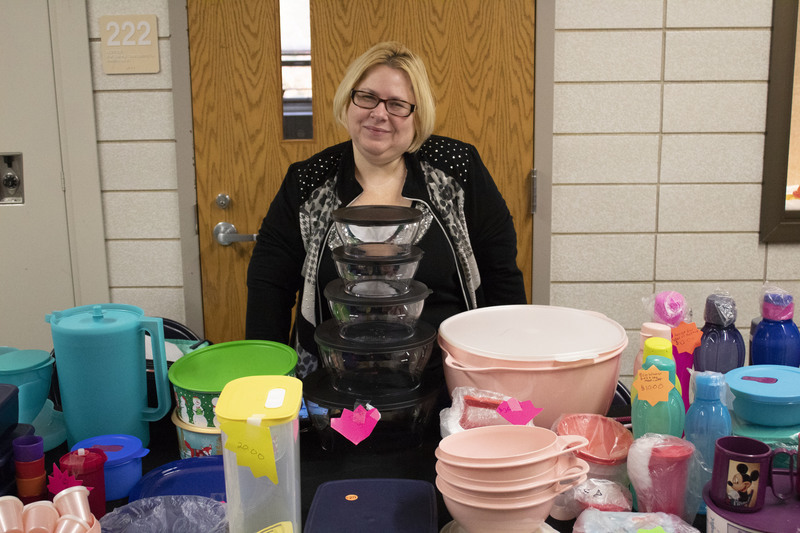 Some vendors were familiar with Alliance High School and the event like Tina Kraner, an AHS graduate, who was selling tupperware. “I saw it advertised on Facebook and decided I wanted to come back to see the old place,” Kraner said. Kraner recalled attending the pancake jamboree when she was in school at Alliance. While she currently resides in Canton, she enjoyed being able to come back to visit her Alma Mater. Another vendor was nine-year-old Kerra Locklear and her 13-year-old sister Alaena Locklear. 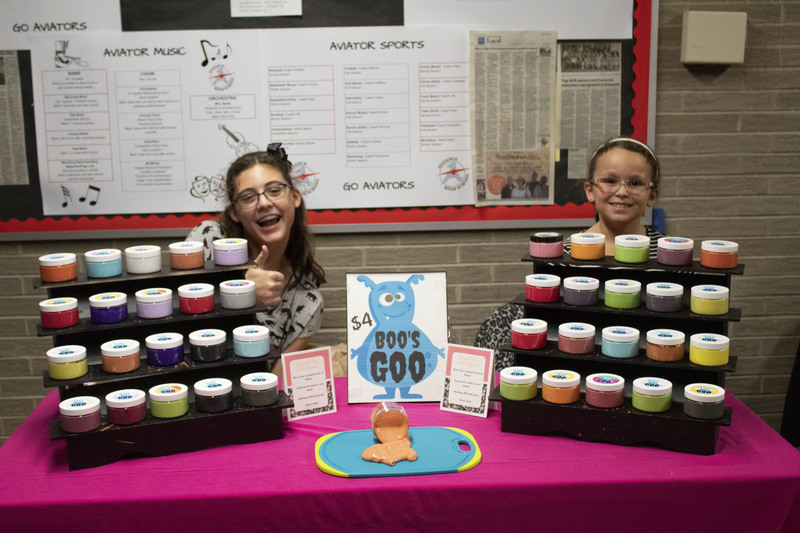 The two students from Minerva were selling Boo’s Goo, or slime, that Kerra, also known as Boo, makes herself with the help of Alaena. The two girls attend craft shows with their mother as often as possible. It was a busy day at AHS, but it’s never too early to start planning for next year’s Pancake Jamboree and Band Boosters Craft Show. It will take place on Saturday, Nov. 2, 2019 from 9 a.m.-3 p.m. Mark your calendars so you don’t miss out on this once-a-year event.